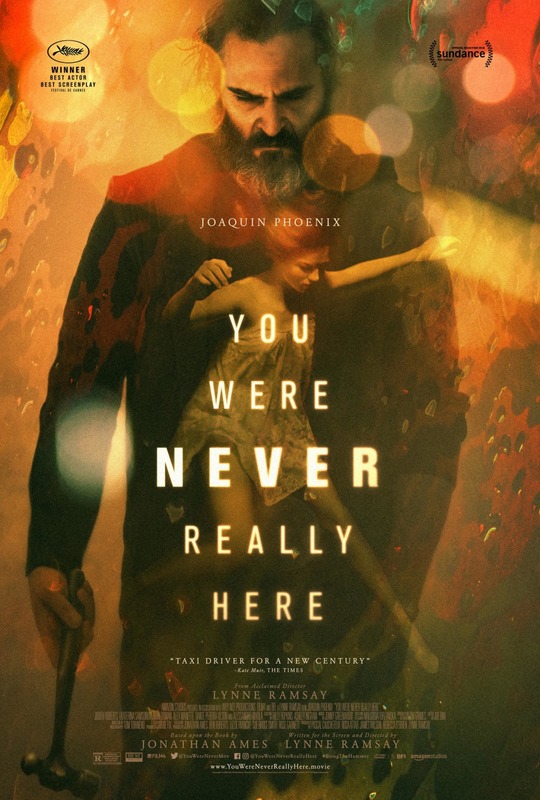 Movie: "You Were Never Really Here"
A combat veteran/former FBI agent named Joe now works as a private mercenary for hire that specializes in finding missing or abducted children and hurting the people who took them. His latest assignment may get him into a situation he was not expecting. It's hammer time! We mean that literally. With a ball-peen hammer. 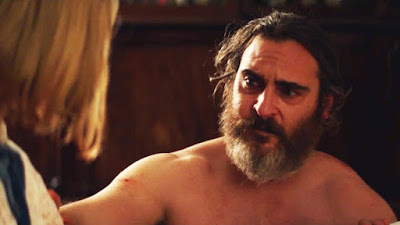 "You Were Never Really Here" is written and directed by Lynne Ramsay, who is best known for her film "We Need to Talk About Kevin." Her latest venture is based on the novel of the same name by Jonathan Ames. It tells the story of Joe (Joaquin Phoenix), a veteran and former FBI agent who had an abusive childhood and suffers from PTSD. He looks a bit shady on the outside, and at first, we weren't sure what to make of him as a character. It turns out that Joe is a vigilante for hire who specializes in finding missing children and hurting those who took them or are abusing them. Joe is hired by a state senator to find his missing daughter but is unaware that this job is about to get him tangled in a conspiracy and will take him to places he never expected. When you hear or read the plot of "You Were Never Really Here," it's easy to see that in the hands of some directors or producers, a project like this could easily be turned into another "Taken" film, a Liam Neeson, Jason Statham, or Keanu Reeves action vehicle with mass crowd appeal. At its most reductive, this movie is about an ex-military man who busts open the heads of kidnappers, human traffickers, and child molesters. It's really Lynne Ramsay's handling of the material that takes it from a run-of-the-mill action flick to a much more raw, gritty thriller. Joaquin Phoenix is perfect for the role of Joe. His performance really helps the audience believe that he is a man who has had a lot of pain in his life and has seen some terrible things. We can see that anguish and agony in his eyes, on his face and in the way he carries himself. On the other hand, there is also a clear tenderness to Joe as a person. He aids and cares for his elderly mother, and he also carefully handles helping the children he looks for and finds. Joe is not a perfect savior. He is a flawed hero who is constantly battling his own demons. Phoenix gives a powerful, quiet, haunting, and haunted performance. It's hard to take your eyes off of him, even when he's bashing skulls and drowning people. Another element that aided our enjoyment of this movie is its sound and score, composed by Oscar nominee Jonny Greenwood. The auditory elements help support the unnerving, uncomfortable nature of the material. It's one of those film scores that you feel in every scene because of its pulsating, almost claustrophobic sound. There are two specific scenes where this is most apparent. The first scene is one that involves someone's face and a pair of pliers and the second is comprised of security camera footage. Coupled with Ramsay's interesting camerawork, these scenes help to elevate the project as a whole. "You Were Never Really Here" is one of the best movies we have seen this year. It has some thematic aspects that can be hard to watch and difficult to handle, but it is a film that will stick with you long after the credits are finished rolling. Aided by Lynne Ramsay's immersive and compelling direction, Joaquin Phoenix's transfixing performance makes this a must-see.